USA Today bestselling author Dean Wesley Smith brings you his first full-length novel featuring the origin story of his most popular character, the superhero Poker Boy. The year: 2004, the last year the World Series of Poker takes place at Binions Horseshoe Casino in downtown Las Vegas. Poker Boy meets the love of his life and forms the team of superheroes and gods that will save the world many times over in the coming years. 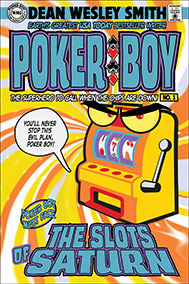 But first, he and his new team must save all of gambling, and more than fifty lives, from the evil ghost slots. And not get killed in the process. The Slots of Saturn introduces the captivating and clever Gambling Universe, where Lady Luck actually exists, the gods employ superheroes, and high-stakes humor often saves the day.